Kind of a funny story. Well, an interesting story. I went shopping recently for some new things and Dillard's was having a major clearance sale. I picked up these pants. They are a size 16P. I bought the matching jacket. It is a size 8P and fits like a glove. It is really hard to shop sometimes. LOL - I much prefer skirts. In which I usually wear a 12/14. Anyway, the pants need a few alterations, but they were only $30, so I will live. While I was out, I popped into JCrew to try on this skirt, which (the pattern) is stunning in person. It is called a "long" pencil skirt, but I had no idea what "long" meant to JCrew. I kid you not, the misses skirt went down to my lower-calf...it was HILARIOUS. I checked the inseam online, and its 25 in misses and 23 in petites. I like my pants to be at about 28.5 (ha!). Also, I tried on the 12, and it was super snug on the backside, but droopy and loose around my tummy and waist. How they managed that, I have NO idea. -___- Not the look I am going for. Maybe I should have turned it around (ha!) They didn't have it in petite in the store I went in, but I doubt it would have fit anyway. Anyone else try this one? I have written/complained about this several times recently - sizing discrepancies are popping up even more frequently than in the past, so it seems. That J Crew skirt - ridiculous! A pencil skirt with a 25" length? Weird. 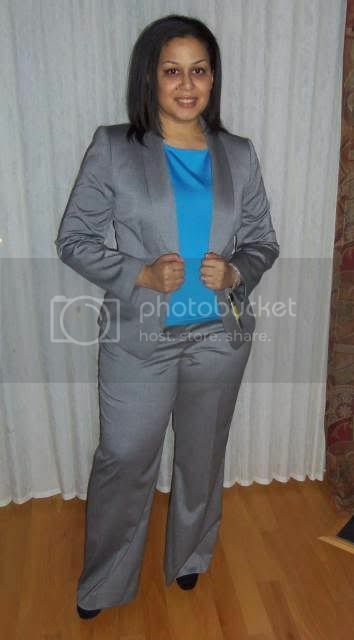 I am loving your grey suit - especially with that bright blue top underneath! Callandra - I honestly didn't even see how they had it styled in the store! LOL - I saw it on the wall and made a beeline right to it. Skirts are usually something I can swing back and forth between misses and petites, but not a chance on this one! :D I hope you get a chance to grab it - its GORGE! Bianca, I totally know what you're talking about with the sizes! I bought some 12P pants at the LOFT to go along with a 4P jacket. Same shopping trip too. And I know I once bought two skirts at Macy's, one in a 12 and one in a 6 on the same trip. Crazy stuff! 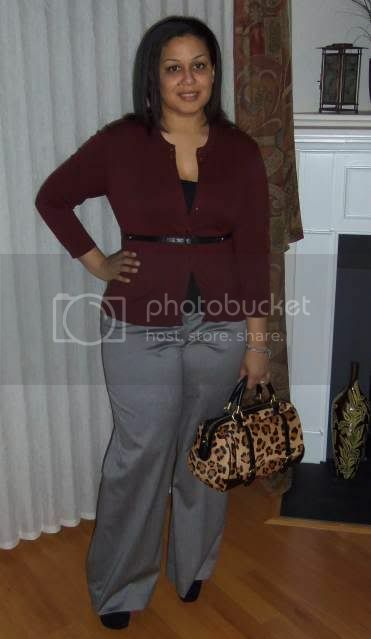 I really like these gray pants with the dark cardigan. So pretty!